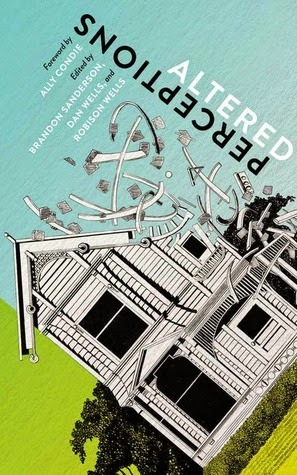 Altered Perceptions, edited by Brandon Sanderson, Dan Wells, and Robison Wells (2014) is an anthology that is three things within a single cover. To start with, this project came in to being as a fundraiser to support Robison Wells during a crippling struggle with debt caused by his mental illness. That part of the story, in which people pledged money in return for a copy of the book, ended last May after raising over $120,000. Secondly, this is a book in which a stellar collection of YA Speculative Fiction share their own experiences with mental illness-- and it is eye-opening how many of them have struggled with various permutations of this. As such, it's tremendously successful at raising awareness and destigmatizing mental illness-- young fans of these authors who are struggling themselves will find they are not alone, that help is possible, that life can still be lived well (and that you can still be a famous author despite it all). Thirdly, it's an unusual anthology in that it's not a collection of short stand-alone pieces. Although there are a few of these, it is primarily a gathering of unpublished writings, deleted scenes, and paths that didn't end up being taken from the worlds of these authors' books. To appreciate these writings, it really helps to be familiar with what's been published. If you are a Brandon Sanderson fan, for instance, you will be thrilled with a whole long section of a book that wasn't what The Way of Kings ended up being. If, like me, you enjoyed Jessica Day George's Princess of Glass, you'll enjoy seeing Poppy again in a scene that didn't make it to the final verson. And so on. If you scroll down here at Goodreads, you can see what the book holds. This is the sort of thing that will certainly be delicious mind-candy for the current fan, but not necessarily appealing in its entirety to those who haven't read these authors. I love that cover. This sounds like an interesting one, and it has some bits and pieces from series I've read.